Padparadscha sapphires are among the rarest gems in the world. Second in hardness only to diamonds, they are known for their lovely pale pink and light orange hues. 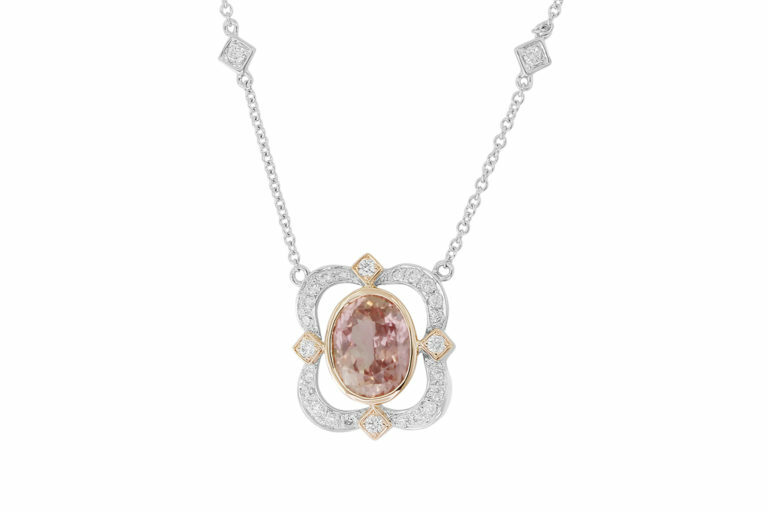 The name Padparadscha comes from the Sinhalese word for aquatic lotus blossom, which are similar in color to this luxe sapphire. This necklace was created with arches of diamonds surrounding the center stone that symbolize the curving petals of a lotus, a flower which pushes through the mud to bloom beautifully. The diamonds that float up the chain are the stars in the sky above this gorgeous flower of a necklace.